Optional Single Supplement: $959 USD (number of singles limited). On our Panama & Costa Rica tour you'll see that this bounteous Central American region is one that is often overlooked by the traveller, a factor which, for many, only adds to its allure. We begin at Panama's most famous attraction; the Panama Canal, an tremendous feat of engineering and human endeavour. Boarding a ferry, we pass through locks that use not water pumps, but gravity to facilitate our voyage and we cross the Continental Divide before taking to land again and heading to Soberania National Park, whose trails tell stories abundant nature and colonial and history. 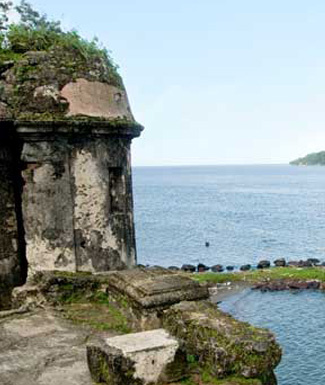 We spend time in Amerindian villages and cast off on boats that have been used by the indigenous peoples for centuries before taking to the tracks on the Interoceanic Train, which follows the Canal though spectacular scenery to Portobelo, once the port of entry and exit for all of South America and a city stepped in pirate legend. We see Panama's nature at its best as our tour leads us through the Chiriqui Highlands with its cloud forests and astonishing arrays of flora and fauna, and when we cross into the Caribbean side of the country to witness the tropical paradise of Bocas del Toro, whose pristine beauty that bewitched Columbus when he first happened upon it centuries ago has changed little. Coral reefs, white-sand beaches and tropical forest keep us occupied in Bocas del Toro until we head to Panama City for a spot of exploration before crossing into Costa Rica. With a remarkable 25 per cent of the country protected by national parks and reserves, Costa Rica offers a nature experience like no other. We amble through lush jungles that come alive with the chattering of monkeys and the squawking of colourful birds and embark on a riverboat cruise to see the remote and untouched areas that other tour companies cannot reach. From relaxing in the bubbling hotsprings near the magnificent Arenal Volcano, to being spellbound by the mystical atmosphere as we take a canopy walk above Monteverde Cloud Forest, we see the best of Costa Rica and marvel at its nature. I found all of the food in all of the places where we ate: hotels, restaurants, excellent. In these countries we had bountiful fruit and fruit juices for breakfast and all meals, salads can be eaten in spite of having raw vegetables. Good fish and chicken. I thoroughly enjoyed the food! We enjoyed viewing the Panama Canal in so many ways - from a boat in the Canal, from the train, and from a viewing platform. We enjoyed the snorkeling in Bocas del Toro; the local guide showed us sea life as we snorkeled. We enjoyed the time in the Tortuguera Pachira Lodge; just sitting outside our room we could see interesting wildlife. We LOVED ziplining in Monteverde. The owner/operator of the butterfly museum in Monteverde was terrific. Arrival at Tocumen International Airport, Panama City. We have an early morning pick-up at the hotel for the 15 minute drive to the port of Balboa where we board the passenger ferry that will take us on the world famous journey through the Panama Canal ("partial" transit; one-way). For many, this tour is a once-in-a-lifetime experience. At the MiraFlores Locks we experience how ships are raised 16 m / 54 feet in a two step process. This activity is achieved by sending water from Pedro Miguel's lake by gravity to fill the chambers where the ship is locked. Once the first set of locks is transited, the vessel arrives at the Pedro Miguel locks to be raised up to 26 m / 85 feet. Again no water pumps are used; they take advantage of gravity to transfer water from Gatun Lake, filling the last Chamber of the Pacific site. We cross the Continental divide and narrowest part of the Panama Canal arriving at the town of Gamboa, home to the dredging division, an important part in the functioning of the canal. The tour includes breakfast and lunch and a specialist guide. Light clothes, insect repellent, hat, sunscreen and very comfortable shoes, are suggested. Do not forget your camera! Today we embark immediately on a city tour. Our tour includes a visit to the ruins of Old Panama and Casco Viejo (the old city compound) which dates from the late 1600's. We will learn of the events in history leading up to the eventual movement of the capital city to its present location. Casco Viejo is home to monuments to Ferdinand de Lesseps and others who were instrumental in the ill-fated French attempt to construct a canal through Panama. Here we visit the Altar de Oro at the San Jose church. As it's name would suggest this large barouque altar is made of pure gold. The church was built soon after the first Spanish settlement was established on the Pacific Coast in 1519. In the 17th Century this settlement was abandoned and moved to it's present location on the small peninsula that that contains the San Felipe district of the city. When the church itself was moved so was it's most famous possession. Our tour ends with a visit to the Panama Canal Museum. Today we travel by bus to Portobelo, once the main port of entry and exit for all of South America. The exchange of merchandise took place annually at Portobelo in the form of a fair which lasted from 30 to 60 days. During this time, this sleepy little place was a beehive of activity. Transactions frequently totaled from 10 to 12 million gold pesos. These fairs took place once each year until 1738 when, as a result of continual attacks by pirates, Spain was forced to abandon the Isthmian route for the longer but more secure one around Cape Horn. The frequent pirate attacks forced the Spaniards to adopt a convoy system. Each year two fleets of 40 to 70 ships sailed from Spain, one bound for Veracruz, the other for Portobelo. Our visit / tour also includes the Maria Chiquita coastal area. For our return to Panama City, we proceed to Colon where we board the Interoceanic Train for a scenic one hour journey back to the capital. The Panama Railroad became the first transcontinental railway when it was completed in 1855 -- of course, a "transcontinental" line is a lot easier to make when you've only got 50 miles to cross! The California Gold Rush brought the new railway lots of business; eventually it was sold to first the French, and then the Americans, in conjunction with the efforts to build the Panama Canal, and it eventually passed to Panama in 1979 under the terms of the Panama Canal treaty. Now it's a private venture, completely rebuilt, with elegantly refurbished passenger coaches. The passenger trade is just a sideline, though. The real business of the railway is freight, moving containers between the Atlantic and the Pacific in less time and at lower cost than a canal passage. The train follows the canal and runs across narrow artificial causeways in Lake Gatun that are indeed spectacular, and the ambiance of the train is very pleasant. We will also go to Aguas Claras to see the new set of locks with their fascinating overflow tanks. This enchanted land is the Chiriqui Highlands, the part of the Cordillera Central that defines the northern border of the province of Chiriqui. Primeval rainforests bedecked with clouds, noisy, chattering birds flash brilliant iridescent colours as they dart about their daily chores, flowering epiphytes bloom en masse high above the forest floor while gurgling streams glisten and tumble hurriedly over great boulders in their dance towards the sea. It is a beautiful landscape of cloud forests, volcanic peaks, coffee plantations and home to most of Panama's Guaymi Indians. This is a very scenic travel day with stops for photos and at various points of interest. * Due to 12 kilo weight restriction on this flight and on the flight from Bocas back to Panama City, we strongly recommend that you pack a smaller bag for the next 4 nights and leave excess baggage in storage at our Panama City hotel. Today we will travel to Cerro Punta to explore the area with a local naturalist guide on a nature walk. This area is good for resplendent quetzal, black and yellow silky flycatcher, prong billed barbet, and the volcano hummingbird. From here we'll travel to the area of La Amistad International Park Headquarters. La Amistad is a bi-national park that stretches from Costa Rica into Panama, a small portion of which extends into the Chiriqui province encompassing mostly cloud forests. Here the land rises in excess of 1500 m / 4,950 feet and warm air ascends the mountains where it meets with cooler air and condenses into a persistent cloud cover. Cloud forests exhibit a unique ecosystem with an astonishing diversity of flora and fauna. We also tour Haras Cerro Punta, a thoroughbred breeding farm in a mountain valley between Cerro Punta and Guadalupe – the highest inhabited part of Panama. The 100-hectare farm is surrounded by one of the most fertile agricultural areas in the country. With an average population of 200 animals, the farm turns out racehorse champions for Panama and beyond. NOTE: The order of our Chiriqui sightseeing may vary due to weather, accommodation availability, and other logistical considerations. After a leisurely morning we prepare for our drive to Almirante on the Caribbean side of the country. En route we stop to view the impressive Fortuna Dam and spectacular waterfalls along the Continental Divide. We will be crossing the Palo Seco Protected Area that serves as buffer zone to La Amistad International Park. The transition from the cloud forests to the coral reefs of Bocas del Toro is impressive. In Almirante we are met by our boat and transferred to the island. Five hundred years ago, Christopher Columbus arrived at a tropical paradise he named Bocas del Toro. Overwhelmed by the most incredible contrasts of vivid colour and sheer unspoiled natural surroundings, Columbus decided to drop anchor and spend a bit of time in this idyllic place. Not much has changed since that pristine time with the exception of the provocative Calypso beat and the alluring accent of the Caribbean inhabitants. Bocas is the best place to sink your toes in the white sand, to explore lush tropical rainforests and coral reefs and to look for the faithful sea turtles that have come to these islands for millennia. Overnight in Bocas del Toro. Ninety-two percent of this island is covered by tropical forest that helps keep a natural balance of the ecosystem. This huge national patrimony has 200 species of plants, 55 amphibious and reptiles, 57 mammals, 200 types of birds, 1500 bugs, and more than 58 species of corals. Bocas del Toro Province is bordered by the Caribbean Sea to the north, Veraguas Province to the east, Chiriqui Province to the south and Costa Rica to the west. Most of the province is on the slopes of the Talamanca and Central mountain ranges, but the majority of its 93,000 inhabitants live in low-lying areas along the coast and on islands. The province contains the large Archipielago de Bocas del Toro at the mouth of the Laguna de Chiriqui, beginning 35km from the Costa Rican border. The chain consists of 68 islands and numerous mangrove keys. Around them are fields of coral, a titanic variety of marine life and water so emerald in colour that Christopher Columbus named the region Veraguas, a contraction of verdes aguas (green waters). Today we have a boat tour to the surrounding attractions of the island so you can appreciate the incredible beauty of this place. There will be time for swimming in the surf and walking along the coastline to Red Frog Beach where you will be amazed by a sort of symphony of rather non-musical chirping that sounds like it must be coming from crickets. When you look closer, however, you will be surprised to find that this strangely beautiful noise is coming from a small frog, about the size of your thumbnail. This morning we should have time (air schedules permitting) to partake in some optional activities -- kayaking, visiting a beach, hiking or merely relaxing in a hammock -- before flying back to the capital. On a hill north of downtown, Parque Metropolitano park protects vast expanses of tropical semideciduous forest within the city limits, and serves as an incredible wilderness escape from the trappings of the capital. Our walking route takes us to 150m-high mirador (lookout) with panoramic views of Panama City, the bay and the canal all the way to the Miraflores Locks. This afternoon we visit an Embera / Choco Amerindian village. We take a boat along the route commonly used by the Indians for their daily transport along the river. A short walk through a forest follows, with a local guide to explain botanical novelties and the culture of this authentic village. We return to Panama City. Today we fly from Panama City to San Jose, Costa Rica. Overnight in San Jose. Hotel Balmoral or similar. This morning we travel by bus from San Jose through Braulio Carillo National Park, one of Costa Rica's largest. If season/harvest time permits, we will visit a working banana plantation and then pass through a region known for its cocoa production. We then board our riverboat and spend the afternoon journeying through myriad interconnecting rivers and canals that take us finally to the Caribbean coast and Tortuguero Park. The park is a water thoroughfare which is a 160 km (100 mile) stretch of natural rivers, lagoons and estuaries, and connecting man-made waterways that run almost to the Nicaraguan border. The canal is the main "highway" of the northern coastal region, complete with directional signs and branches from the main trunk route. As we go along the canal, keep a keen lookout for views of pastel-coloured toucans and monkeys of various type; if we're lucky, a lazy sloth hanging from a branch, and maybe a coati or two roaming the forest. Stands of mangroves and water hyacinth appear here and there. Scattered along the way are people, too -- fishers and farmers whose dugouts serve all the purposes of pickup trucks elsewhere. Mostly the banks remain wild, and the calls of monkeys and whistles of birds predominate over the noises of humans. Tortuguero Park is a fascinating place to explore. An early morning boat ride offers an opportunity to observe an awakening coastal rain forest full of lush vegetation and unique bird life. After lunch we visit the village of Tortuguero accessible only by river boat; you may choose to walk on the Caribbean beach where several turtle species lay their eggs each year. We will visit the Tortuguero Museum with its excellent displays pertaining to the ecology of the area and an informative video presentation specific to turtle conservation in Tortuguero and the entire Caribbean region (the Green Sea and Hawksbill turtles' nesting season runs from July to October with the peak in August, and the Leatherback turtles nest from February to April. It is possible to see individual turtles at any time of the year). NOTE: The exact order of our activities in Tortuguero may vary depending on weather and other variables. 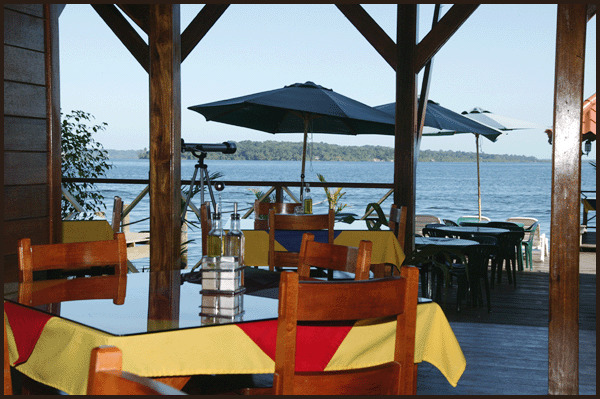 After an early breakfast we travel by boat 1½-hour from Tortuguero to the Cano Blanco dock. From there we continue by road (+/- 5 hours) to the La Fortuna/Arenal area. We travel through rolling hills covered with sugar cane fields to overnight near Arenal Volcano. We make a stop at the Baldi Hotsprings (located near Arenal and outside the Risk Zones established by the National Prevention of Risks and Emergency Commission). Here a geothermally-heated river flows through beautifully landscaped grounds featuring many plant and tree species and great birdlife. We will have time to relax in or around the various pools (bring a towel). The springs feature several hot pools with different temperatures fed by individual springs and three swim-up bars. This evening (weather & volcanic activity permitting) we can view the volcano. Overnight at Arenal / La Fortuna. Our tour occurs around the base of Arenal Volcano, where you will see some of the evidence that remains of the massive 1968 eruption. Along the way our guide will point out the wildlife that has persevered through the tumultuous mid-century period of volcanic activity. In 1968 lava covered huge swaths of the jungle, and has since hardened into black lava flows, smothering miles of rainforest growth. Now the base of the volcano is host to several different ecosystems, including secondary rainforest and clear, open spaces with relatively thin vegetation. Along the trail our guide will point out to you volcanic boulders that the volcano shot out during the eruption. We’ll also walk along the edge of Arenal Lake, the largest dammed lake in Central America. During the hike we'll come to a few viewing points where you will have an excellent view of the volcano. At the end of the trail we'll reach an observatory with an optimal view of the volcano (weather-permitting!). * This tour is leisurely in nature, with undulating terrain on a well-maintained track. By this point on the trip, your group leader will have a good sense of your abilities and can discuss your suitability for the excursion a day or two prior. Overnight in Arenal/La Fortuna Area. Today we travel through a rustic rural countryside to the Monteverde Cloud Forest Reserve area (+/- 4 hours). that live at the upper levels of the forest, and take their nutrients directly from the mist and dust that pass through the air. The result is an enchanted fairy-tale environment where trees are laden with orchids, bromeliads, mosses and ferns that obscure their branches, where the moisture and mild temperatures and sunlight filtered by the forest canopy encourage the exuberance of begonias, heliconias, philodendron and many other tropical plants in every available space on the ground. This afternoon we have a guided tour of the "Butterfly Garden" where butterflies and other endemic insects are raised and protected in a controlled environment allowing scientists to study them -- their place in the food chain and their response to things like increased pollution and climate change. We have a full morning exploring the cloud forest reserve with the help of a local naturalist guide. There is more to the forest than the trees and lesser plants. Of over 320 bird species, the most notable is the quetzal with its long arc of tail feathers. Assorted trogons in addition to the quetzal inhabit the reserve, along with more than 50 varieties of hummingbird. About 500 kinds of butterfly are found at Monteverde. Among the more than 100 mammalian species are howler, white-faced and spider monkeys, coatis and their cousins, raccoons; as well as the rarely observed pumas, ocelots, jaguars, tapirs, and kinkajous. This afternoon you may choose to go on an optional "Canopy Walk" excursion, located within the cloud forest. Suspension foot-bridges are strung across deep gorges allowing one to get a bird's eye view of the forest from a totally different perspective than we experienced this morning. At a leisurely pace, one can complete this easy and fascinating walk in about 90 minutes. Your Tour Leader can help you plan this activity (your Tour Leader will advise re the current price while on tour). REMEMBER: This can be a wet and windy place by definition; you should be prepared for varied conditions. Today we return by road to San Jose. Time permitting, we recommend a visit to the Gold Museum in downtown San Jose (optional), easily the country's best with thousands of different examples of Pre-Columbian gold artifacts (the museum closes at 16:30). Health ...	guests can work out at the well-equipped gymnasium or relax at the refreshing sauna or take a dip at the relaxing swimming pool. This charming hotel offers a unique blend of simple elegance and historical ambiance of Caribbean wood craftsmanship with the sparkling ...	beneath. Nicely appointed with wood and nautical furnishings the 11 room boutique hotel offers the concept of comfort with 400-thread count cotton sheets, WI-FI , flat Screen cable TV, air conditioning, telephones, coffee makers, ocean and town balcony views. 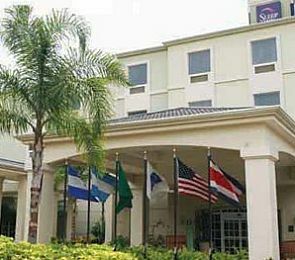 The Sleep Inn San Jose conveniently located in the heart of the city, only fifteen kilometers from the Juan Santamaria ...	Airport. It is only a short distance from tourist attractions like the Teatro Nacional, Museo de Jade, and Museo de Oro. 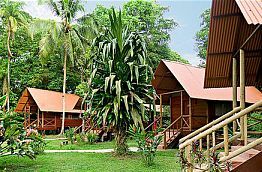 The lodge is strategically located only 5 minutes away from the extraordinary Tortuguero National Park, and right across the main ...	facing the town of Tortuguero. Surrounded by a network of very scenic canals, this is considered one of the most exotic regions of the world, characterized by its rich in flora and fauna. 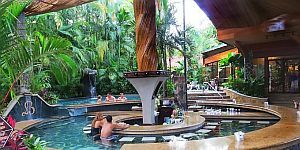 Set at the base of the Arenal Volcano, this upscale hotel and hot spring is modern with rustic rooms with ...	areas and terraces or balconies, as well as minifridges and tea and coffeemakers. Breakfast and dinner daily (hotels and local restaurants). All transport, sightseeing and entrance fees for sites noted as 'visited' in the detailed itinerary. Gratuities for local guides, drivers, restaurant staff, hotel porters (if available). Airport transfers for land & air customers and for early arriving/late departing land & air customers who book their extra hotel nights through us. 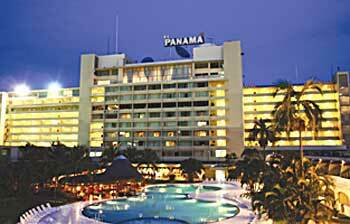 PANAMA: This tour is offered during the northern winter and outside hurricane season. Temperatures are high across the whole country throughout the year, though cooler at higher altitudes. The rainy season lasts from May to November. COSTA RICA: In the Central Valley (San Jose) the average temperature is 22C (72F). In the coastal areas the temperature is much hotter and humid. The "green" season runs May-November. The warm dry season is Dec-May, though temperature differences between summer and winter are slight. Road transport by private air-conditioned motor coach, 12-32 seats depending on ultimate group size (see 'group size'). Numerous nature walks and walking tours on uneven surfaces. Internal flights in Panama via scheduled domestic carriers in smaller aircraft with limited space for luggage. Panama City-San Jose via scheduled airline. Well-located, heated/air-conditioned, mid-range (3 star) hotels with en suite toilet and bath throughout (probably shower only). Single rooms are limited and likely smaller than doubles. Hotel porter service is sometimes available (see 'inclusions') though you should be independent with your luggage. Some hotels have outdoor swimming pools.